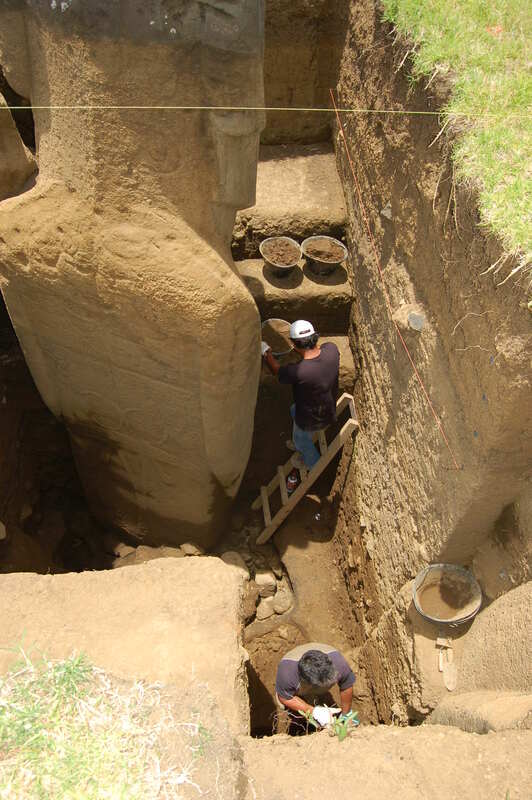 This report is another in a series of reports dealing with the excavation of statues RR-001-156 and RR-001-157 in Rano Raraku quarry, Rapa Nui, Chile. 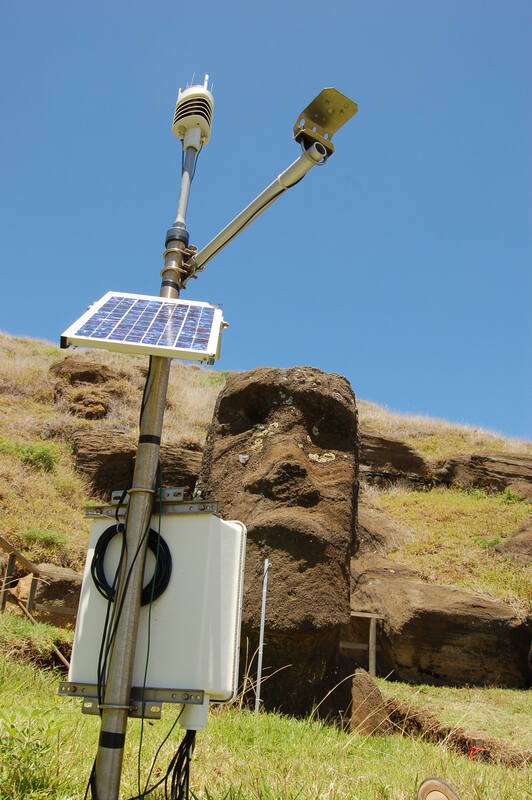 The previous reports were filed with the appropriate Chilean and Rapa Nui agencies and also provided to the general public on the Easter Island Statue Project web site (www.eisp.org). This report deals with the continuing excavation of statue RR-001-156 to the base and Square 4 of RR-001-157. 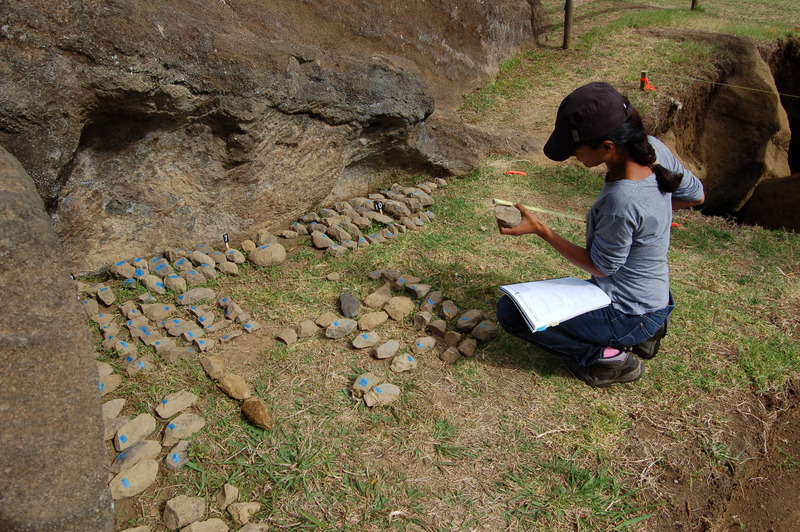 These activities took place during Season V (November 2011) of the Easter Island Statue Project Conservation Initiative. Vaiheri Tuki Haoa maintained the field objects register and acted as field photographer. The register assigns a pre-printed FO number to all toki and toki fragments but also to other classes of objects. This season the first number assigned was F307. Toki are superficially cleaned and measured in a standard manner following a field diagram, and then the measurements are recorded on each diagram. Each object is photographed using a gray card and metric scale. These photographs are meant to be a field record only; selected objects will be re-photographed for publication or presentations. The dates of most recent fires in the interior of Rano Raraku are recorded in the EISP archives; a few have been deduced by reference to historic photographs. The most recent large fire was on the interior of Rano Raraku in July, 2011. A report indicating which statues in the interior were in contact with the fire was submitted by Van Tilburg to CONAF under separate cover as an additional part of our regular end-of-season field report. 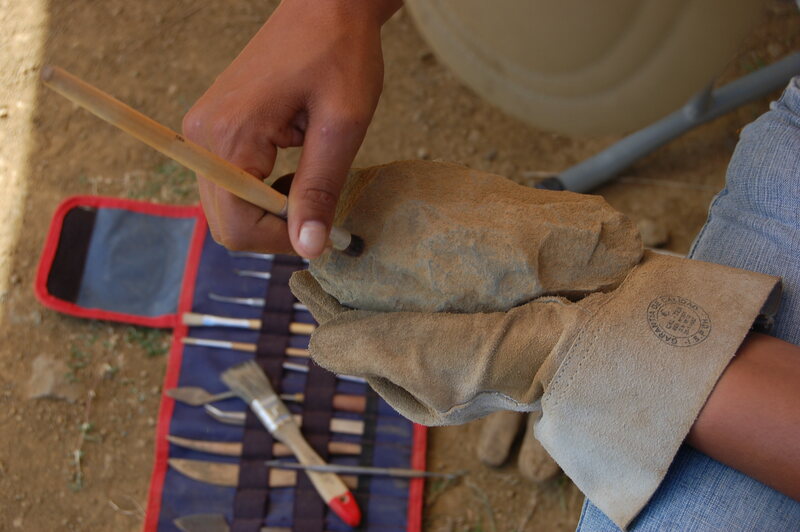 We expect to find quantities of carbon throughout the various excavation levels and our obvious objective is to collect carbon samples from each level. In the case of human bone, we know from Routledge’s (1919) unpublished field notes that she found and attempted to remove at least one burial from behind each of our two target statues but, in the process, found the fragments to be wet and fragile and possibly damaged the material, some of which was then apparently returned to the excavations. However, and as we pointed out in our Season II report for excavation of RR-001-157, we found a fragment of what we believe is a human cranium in the carving canal of Quarry Two. This material was collected and is given in our field report for that season. Samples of both carbon and bone identified during either digging or screening are collected with gloves and/or metal tweezers and stored in plastic vials (see below). 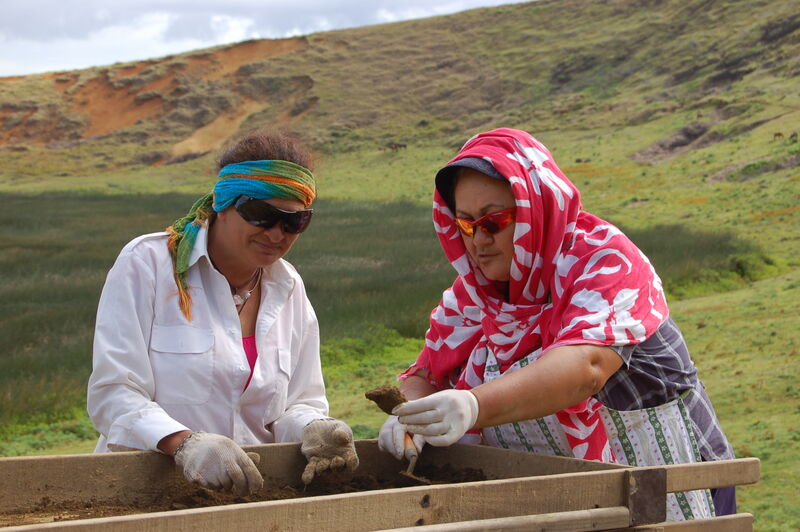 In the case of probable human bone, all of which is retrieved in fragments, a screened-off section of the excavation camp is protected from tourist view or photography and either Melisanda Pakarati or Vaiheri Tuki Haoa collects the material. Human bone retrieved through our excavations is logged and then stored in plastic vials within archival safe paper level bags. The bags are all kept together in the same storage box. That box, as well as all other materials collected, will be delivered to the local museum upon completion of the excavation. Quantities of carbon are hand-collected during the excavation process, during screening, or often by floatation during the washing of level bag contents. The material may be small particles that appear to be from grass-like plants or larger, apparently hardwood shrubs. The color and hardness of some materials is familiar and recognizable to the project screeners. Level bags are acid free dry sample Kraft paper envelopes in three sizes with fold-over metal ties. Vials are 12 dram archival safe clear plastic with snap-on white lids. The vials are all stored in level bags and given the same number as the level bags. Identifying labels are also placed on the vials. Bags collected are numbered consecutively from one to the final number for each season, with a new sequence the following season. They are sorted by unit, square, level and date and entered into a Day Log. They are then stored in numbered boxes by season. Boxes are stored temporarily in the Mana Gallery until their contents are inventoried at the end of the excavation or following analysis. The final deposition of the boxes will be in the island’s local museum. The I.D. number assigned to each bag consists of the statue identification and the bag number (RR-001-156-001, for example). During Season II the date was appended to this number, but subsequently it was not and the I.D. was standardized to the unit, level and bag number. Objects and artifacts are rinsed in clear water and dried before final storage. The contents by material, object type (if classifiable) or group description and count are given on the outside of each bag. A final materials report is appended to each season’s field report. 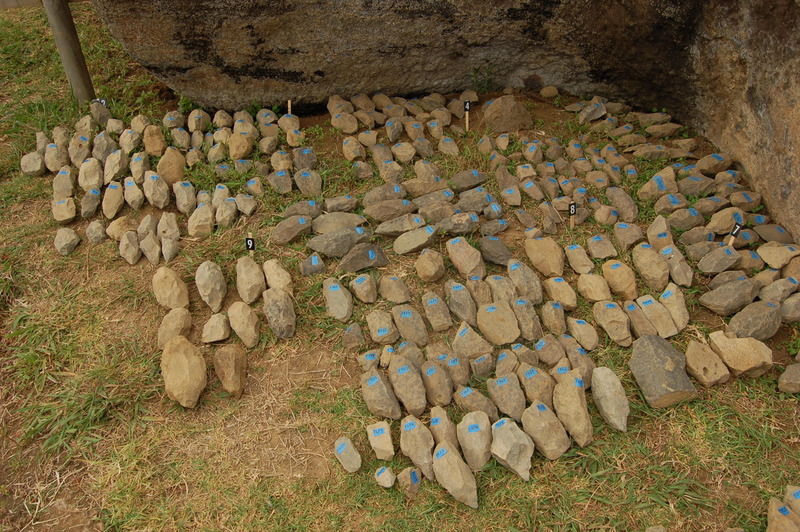 Every toki and toki fragment, along with any other individually cataloged artifact is assigned an individual Field Object (FO) number and photographed. An initial and final site overview photograph was originally taken each day. The motivation for this was the April, 2010 vandalism to our equipment. Later, this precaution seemed less vital and some days these photos were overlooked. Photos of each completed level in each square, along with general site documentation and activity overviews, are taken daily. The photos are downloaded each day and captioned as required. The entire record is then migrated to the EISP image database and stored there by season. Ultimately, a full photographic record will be filed with the DATASHARE record for each excavated statue. At the end of each field season a field inventory record of bags collected with materials and counts given is created from the Day Log. During this field season we began an initial inventory data check of the bags collected to date in order to assign each bag to a box. The bag identifications and contents were matched against the computer generated list previously produced. This task will be completed in March prior to the transfer of the boxes to the island’s local museum. The island’s local museum is known as Museo Antropológico Padre Sebastián Englert (MAPSE). It is a unit of Departmento Bibliotecas, Archivos, y Museos (DBAM), as is the Consejo Nacional de Restauración y Conservación, represented on our team by its director, Mónica Bahamonez Prieto. Storage of our collected materials in MAPSE at the end of our excavation time frame and scientific analysis of selected materials will be carried out in accordance with our permit to excavate. Cultural material in the stratigraphy is generally limited to basalt and/or obsidian chips and flakes as well as to apparent toki fragments. 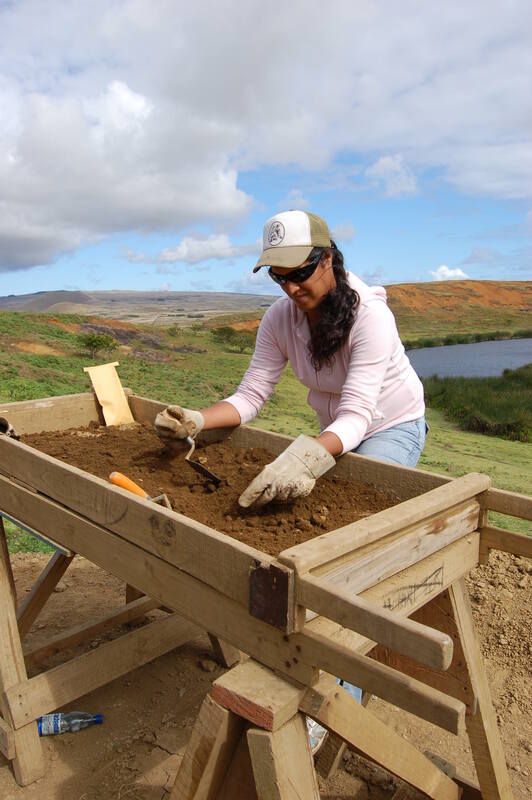 With the single exception of Jo Anne Van Tilburg, and during all field seasons except I and II, our field crews are made up of Rapa Nui community members and students. 9:00 AM Breakfast: Rosa Paoa Icka and Anastasia Paoa Icka de Hey. Today is clear, cool and windy. Our objective is to shovel scrape squares 7, 4, 12, and 13 and to clear the surfaces of extraneous material and remove any intrusive vegetation that has appeared since our last field season (July-August 2011). One bag of assorted small obsidian flakes was collected from the surface of Square 7 by screening. Nearer the sidewall of the adjacent Square 4, we collected another bag of assorted material that had weathered out of the sidewall. The soil removed from the surfaces of Squares 12 and 13 was dry and apparently sterile and we did not screen it. We excavated Square 7 extension (under the papa) from 220 to 245 cm and collecting by screening assorted, fragmented material from 228 cm to 245 cm. These included 11 bags of various obsidian, basalt, and coral material as well as 4 vials of carbon. Red pigment (kie’a) was present in small amounts. The bone material retrieved included fowl, rat and sheep. One interesting piece appears to be a fragment of a human femur with incised marks on it that consist of small “x” forms. The material with the highest count is obsidian, one piece of which is a small core. At the end of the previous field season, the sensor that had been installed on the ventral side of RR-001-157 was removed to the back of the statue, in accordance with the project’s conservation data recording objectives. Very hard rain, variable winds all last night and today. Breakfast and lunch with the crew and then, after lunch, we ventured out to the quarry after the skies had cleared. Cristián and Pato excavating in Square 7 extension from 245 to 295 cm. Materials consisted largely of obsidian chips and flakes, along with minute amounts of kie’a scattered throughout and a quantity of carbon. Rain began again at about 5:30. It was pouring rain all night and again during the morning. Field work is canceled and JVT, Vai and Alejandra work in the field office of the Mana Gallery, taking an inventory of the bags collected to date in order to assign them to permanent storage in one of the boxes. Season I bags were checked against the printed bag inventory and all are in sequence. Season II and following bag count is attached to the Season IV preliminary field report, and the bags are checked against that list. All human bone, no matter from which excavation or level it was collected is logged separately into Box 3. Despite the rain yesterday, the excavation is not soaked, although there is some standing water in the deepest level. This was removed before we began additional work. Drainage from the slope through the backfill of RR-001-157 created a shallow rivulet in the soil about 2 cm deep and running from the SW corner of Square 16 through Square 14 to Square 10. It stops at the back of the statue at the right shoulder. There are two other similar rivulets visible in the soil and all three were marked on our grid map. There is no erosion at all from the backfill into Square 4 of RR-001-157 or the excavated areas of RR-001-156. We began the day’s work in Square 7 at 320 cm. The work was done with the use of trowels. Some coral was found, as was red pigment (kie’a) scattered throughout in small amounts. Carbon, probable rat bone, and fish bone were all collected. All of this material, including carbon which varied from that of apparent grass to small shrubby material was found very close (less than 10 cm) to the back of the statue. 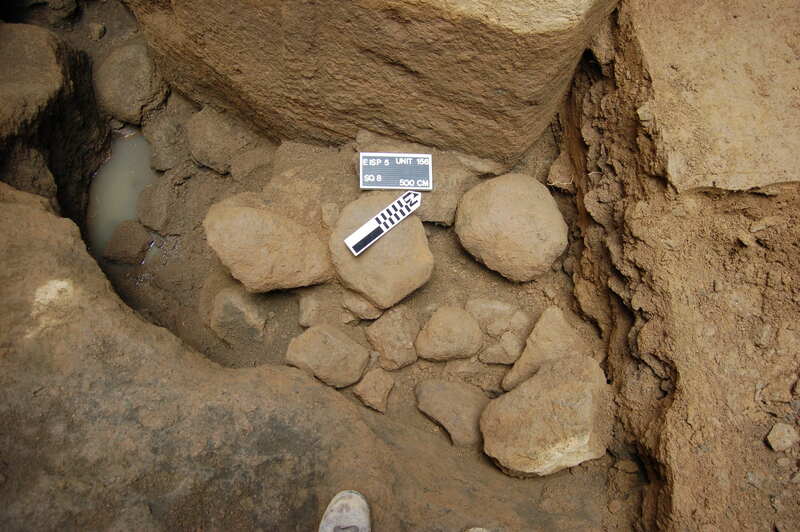 The sidewall of Square 4 revealed some bone, which was removed at the 276 cm level (Square 4 was last recorded at the 300 cm level). The dirt throughout is dense and wet but not soaked. Tahira Edmunds arrived in the afternoon to download our environmental data. 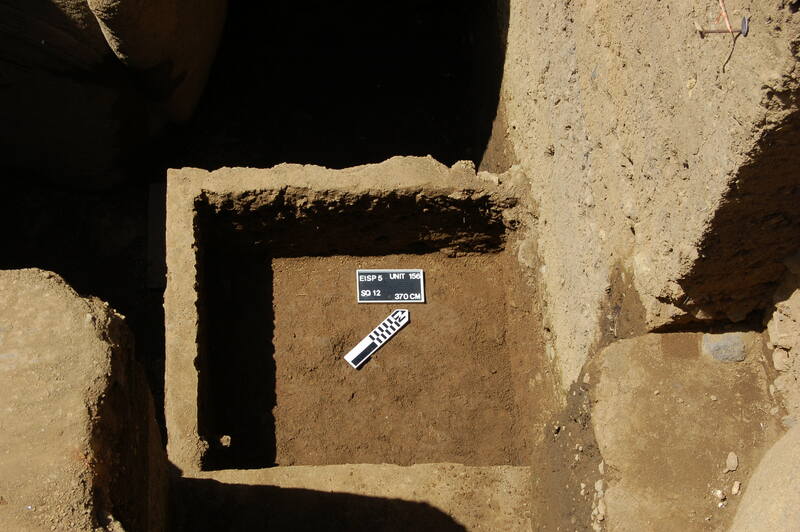 Excavation of Square 7 was ended at the 373 cm level. Beginning in Square 7 at 373 cm we found the soil dark brown and also still somewhat wet from Sunday’s rain. A concentration of carbon was found near the back of the statue and on top of and in packed stone consisting of 6 small boulders, including several small round beach pebbles (maea poro). This appeared to be the first level of packing inserted in order to support the statue in its upright position. Several toki were collected from within these stones. We surface cleared Squares 8 and 9 following the rain, but collected nothing of interest. We began Square 10 at 325 cm and stopped Square 7 at 425 cm. Eight more toki were collected from Square 7 at 410, including one very fine example of good basalt. In Square 10 below 325 cm the color of the soil changes markedly from dark brown to yellow lapilli. We began Square 10 at 325-425 cm. JVT carried out the Field Object documentation. Some bone, including fish vertebrae, was collected, along with an ample amount of obsidian chips and flakes. Nearly all of the toki were collected from Square 10 at 325-425 cm. Square 11 is at 357 cm. Square 11 includes 6 large, flattish rocks embedded in the sidewall joining it with Square 12. We began excavating Square 12 at 330 cm. It was dug from the interior and then the sidewalls were collapsed into the excavated square and removed (see photos).at 370 cm. While the curved, bas-relief line known as the maro curved across the back and reached under the hands of RR-001-157 (as per usual), on RR-001-156 we find that the “maro” stops on the side above and not under the arm or hands. The marked spine does not descend below the “Y” portion of the design. The modest quantity of maea poro we have retrieved from this excavation and that of RR-001-157 suggests that these small beach cobbles or pebbles, most of which are nearly flat on one side, may have been used to buff or finish the stone surfaces of the statues in the way that, it has been previously speculated, coral nodules were used at, for example, Ahu Naunau. Four cupules are arrayed horizontally at the precise point on the back where the gray and black above ground line meets the lighter brown color of the previously excavated (by the Mana Expedition) level. The right side of the tangata manu or mangai design is actually carved into two levels of stone, one of which has flaked off. Across the shoulders the surface of the stone is worn as if it was rubbed smooth. There are 7 cupules on this surface. The rounded patch of exposed conglomerate on the right side (also previously visible in the Mana Expedition photos) has destroyed the petroglyphs that were carved into it, one of which is a crescent or vaka. Below that level the stone surface is scarred by vertical lines made by the roots of vegetation. A deeply etched vaka runs right across the middle of the back. On the right side a composition of curvilinear elements is included within a square divided into segments over which two vaka are carved and under which another angular/linear element appears. The objective today is to carry on with the excavation of Square 12 and to complete screening of Square 4 Extension (under the papa). We are now in previously unexcavated levels. Final depth of Square 4 today is 233 cm. In Square 12 we exposed a concentration at 393 cm deep of 52 stones (including those in the sidewall) from small to large in size. 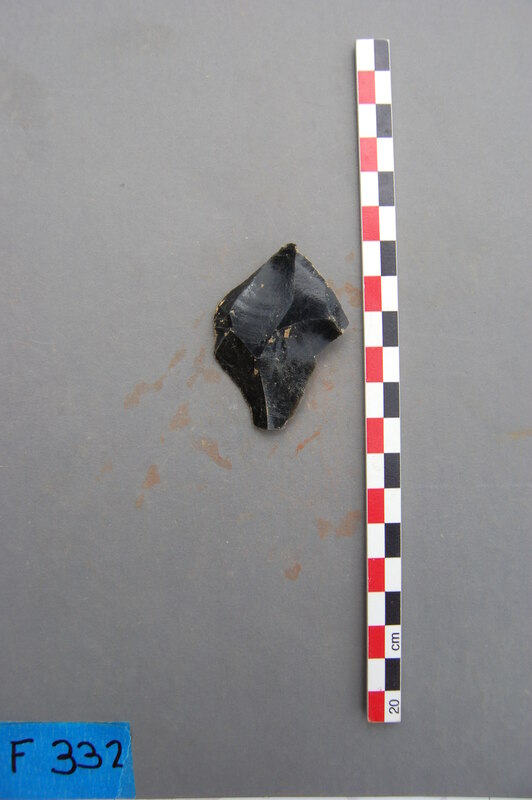 In Square 4 Extension we exposed a concentration of toki fragments, many of which are broken horizontally. Some large stones are also wedged between the left arm and the papa of Square 4. One-half each of Squares 10, 7, and 4 were removed at the same time at the level of 425 cm and designated as Section 1 in our records. A quantity of fragile bone fragments was encountered roughly parallel to the statue’s back and was removed by hand. Within Section 1 a single, very well made toki broken in half was found in Square 7 at about 10 cm below the surface. One half each of Squares 4, 7, and 10 were dug yesterday as one unit designated Section 1 from 425 to 474 cm. Square 7 was dug by hand today individually from 474 to 500 cm. The papa was exposed on the west side along with a large quantity of stones, all of which were excavated and cleaned by hand. The soil was very wet and included a few toki. A large quantity of concentrated decomposed basalt that included flakes and chips was found throughout. The base of the statue was reached in Square 7 at 12:00 on the left side near the papa. Square 7 promptly filled during digging with water 1-2 cm deep. It seeped out from under the papa. This explains the fact that the back and side of the statue are thoroughly wet in all of our photos. Rain also started at about 1:00. Rocks removed from Square 7 were stored separately. At 500 cm in Square 7 we reached the statue base. We begin in Square 12 at 370 cm. Four large stones were documented in place and then removed and the square excavated down to 434 cm level (measured from ground level). More stones were encountered, then documented and removed. All of the stones appear purposely placed and not merely debris washed down from under or near the papa. The concentration appears to be supporting or otherwise bracing the statue in place. About 15 toki were removed from this area. Further surface cleaning of Square 7 initiated. The papa in this area cuts through Square 7 at an angle. In Square 8 sidewall a rock concentration is visible. Water continues t seep out from under the papa. The statue back is damaged on the left side near the base and that damage is clearly related to the original pressure from the papa on the back when the statue was raised upright in place. One of the “dents” in the back of the statue is nearly precisely opposite a protrusion in the papa. 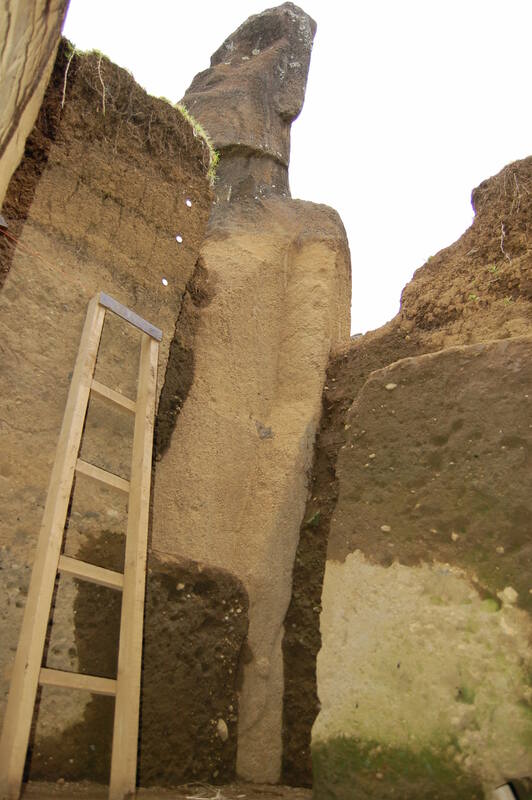 This situation was also noted by Routledge in another of her excavations on the interior (see EISP archives), where she comments on a “containing wall” cut into the papa and used to stabilize the statue upright in place. A large, roughly pecked taheta is found in Square 8 sidewall and removed. The final level measurement of Square 7 is made into the water at 540 cm. One half of Squares 10 and 11 are removed for convenience of the excavators at the same time at 434 cm but the soil is screened separately. The papa is visible in the half of Square 11 at 458 cm and photographed. A basalt core used for toki production is recovered. A vertebra of tuna or other large fish is recovered at 453 cm in Square 10. A small quantity of red pigment (kie’a) is recovered from 466 cm in Square 11. A large concentration of decomposed basalt including flakes and chips is found at 528 cm in Square 11. Some fire reddened stone also recovered. We excavate Square 8 from 420-500 cm, level the surface and photograph it before removing the large stones found at the lowest level. 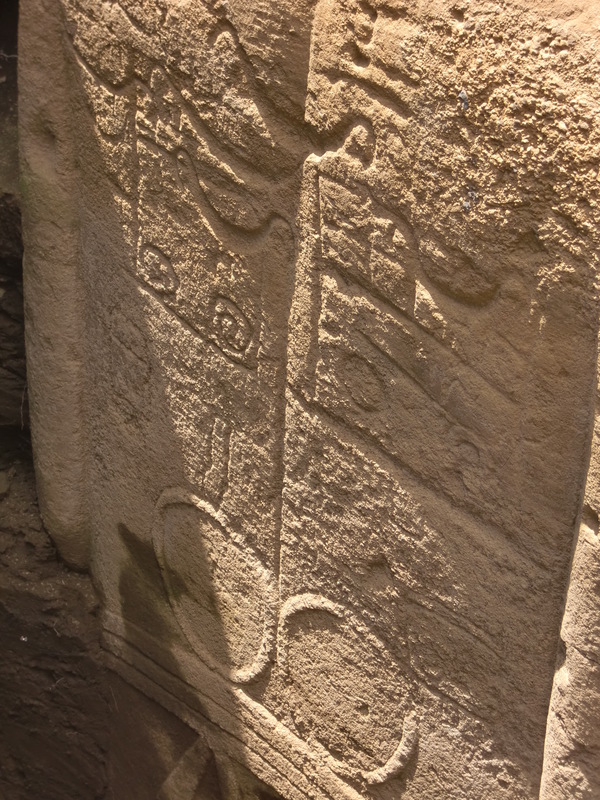 These stones are covering part of the vertical portion of the “Y” design and we are thus able to reveal the entirety of the design. The “stem” of the design is at 500 cm and is finished but damaged and disfigured. We begin Square 12 at 437 cm. A few toki are removed from the top levels of this square. Another wedge-like “dent” in the back of the statue was caused by pressure on the papa and appears at the right side near the base. This same sort of damage is sometimes seen on statues along transport roads. A large round concavity that is evidence of cutting the statue loose from its “keel” is filled with decomposed basalt is exposed in the papa at 504 cm. Square 9 is begun at 434 cm. 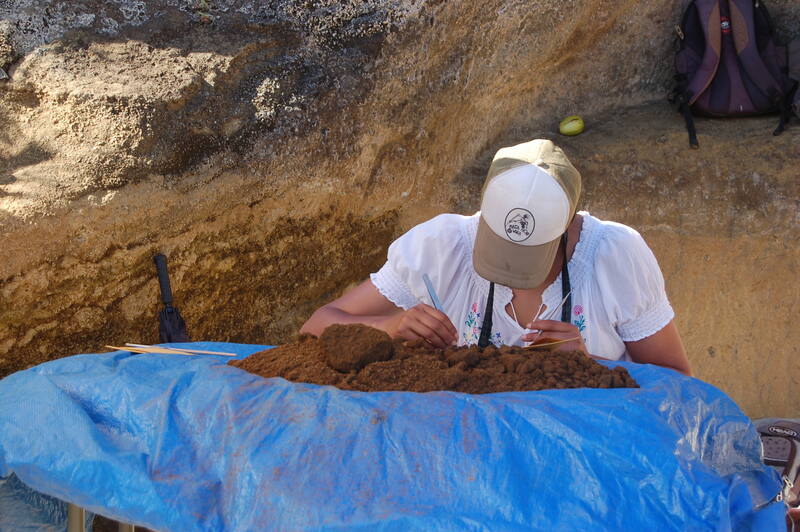 A quantity of soil containing human bones is examined and the bones retrieved; the soil is then returned to the excavation. Four large stones are exposed that are placed under the left side of the statue in a hole in the papa. They are of basalt, of varying sizes and not worked. The “keel” of the statue is also further exposed on the right side of the square. A deep wedge or flake of stone was apparently dislodged on the left side of the statue during the act of setting the statue upright. In Square 9 we encounter a mass of dark gray to black decomposed basalt in which there are, as well, scattered basalt flakes. 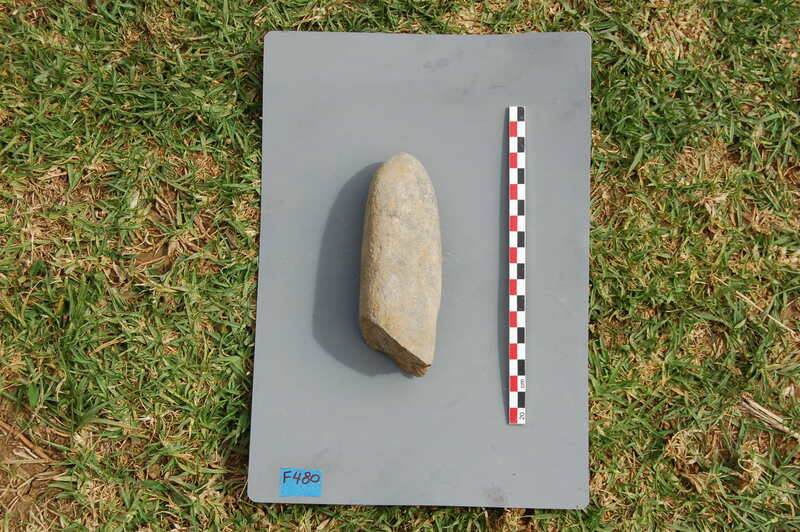 This suggests that at least some tool fashioning took place immediately next to the statue. We removed one-half of Square 9 to reveal more of the rocks and all of the base rock. All of the loose rock is stored separately and will be returned to the pit. It reaches back into Square 12 and then turns. The statue is actually set into a hole about 1 m deep cut into bedrock. Square 9 was leveled at 496 cm deep on top of the papa. We decided to turn to Square 4 (RR-001-157). This area between the two statues has not been previously excavated, and we collected a mass of carbon including large pieces of hard wood. The area seems to have contained an umu. An inventory of the curvilinear and angular/linear petroglyphs on the dorsal side of the statue was made. 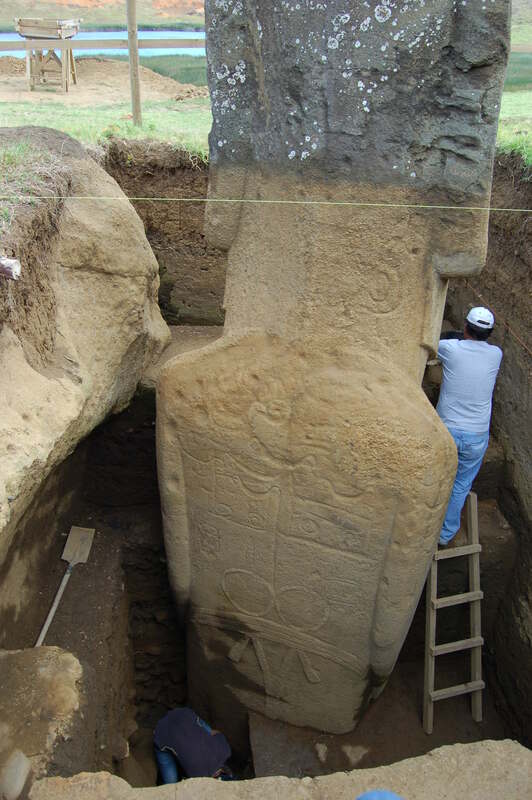 The goal today is to excavate Square 4 (RR-001-157), which is the connecting square between the two statues. This area, as the historic photos make clear, was never previously excavated. 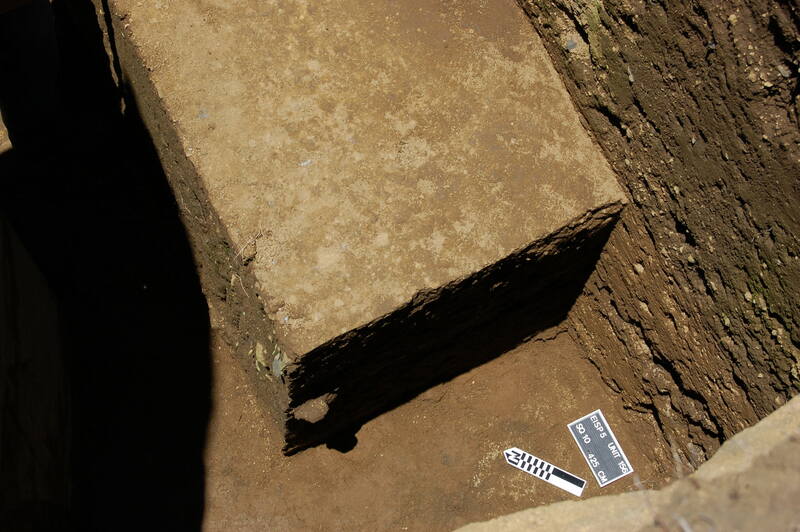 We reached the final goal level here (330-434 cm) and exposed the rocks which make up the floor of the square. A quantity of carbon was retrieved from among the rocks, some of which show fire reddening or burning. A disk somewhat like the pupil of a statue eye was also collected, although it is made of Rano Raraku tuff and not the usual red scoria or obsidian. We also found, as in the other squares at this level and deeper, beach pebbles (maea poro) possibly used for smoothing the stone surface of the statue. On 24 November we noted that the sidewall beginning at the SE corner of Square 4 (RR-001-157) and including Squares 12 and 9 of RR-001-156 was weak and reported to CONAF our intent to remove it that day or the next. This in part due to the weakness of the wall, but also because our intent is to complete the stratigraphic drawings for RR-001-156 and, as well, the plan of the statue keel and other related base areas. This documentation is complex. Removing the wall also exposed the left side of RR-001-157, especially the left hand, and allowed us to document the full details of the statue keel and other aspects of the base area for RR-156-001. 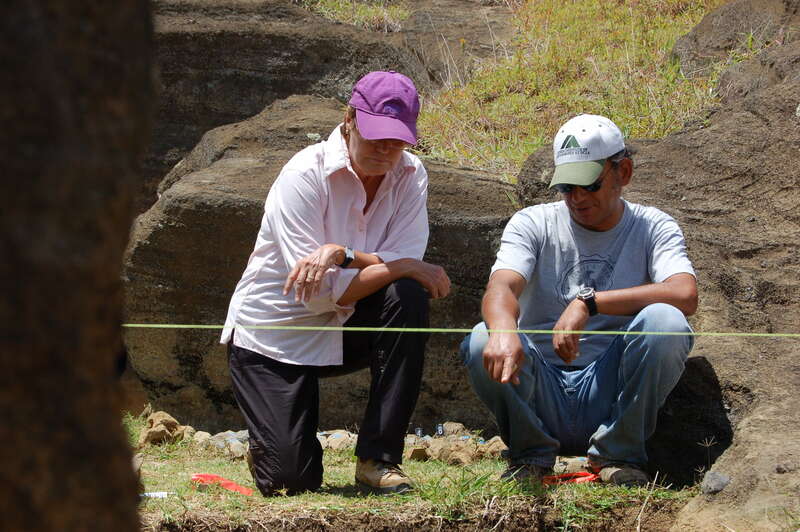 This documentation is on-going and conducted by a partial crew during hiatus from actual excavation. Downloading of environmental data is also continuing according to plan. 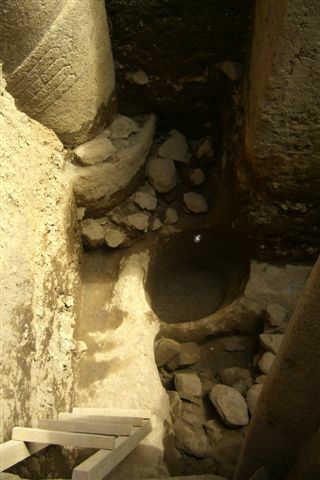 The excavation will resume with a full crew in mid-March, 2012.